Brexit, the U.K.’s effort to depart the European Union (E.U. ), was voted on nearly three years ago, but negotiations remain contentious and plenty of market observers expect more political volatility in the U.K. over the next several months. Recently, Prime Minister Teresa May was able to persuade E.U. leaders to give the U.K. more time to prepare for its E.U. departure. Originally, the U.K. was supposed to leave the E.U. in March, but that was pushed back until April 12. The latest effort by May bought the U.K. until Oct. 31, but May’s position is still seen as untenable. Even against the backdrop of Brexit volatility, European exchange-traded funds (ETFs) have been solid performers this year. The iShares Europe ETF (NYSEARCA:IEV), which tracks the S&P Europe 350 Index, is up 13.38% year-to-date. IEV allocates almost 28% of its weight to U.K. stocks, by far that Europe ETF’s largest geographic exposure. Here are five Europe ETFs to consider as May fights for her political life and as Brexit talks move forward. Among Europe ETFs trading in the U.S., the iShares MSCI United Kingdom ETF (NYSEARCA:EWU) is ground zero for investors looking for Brexit-related ideas. EWU, the largest U.K. ETF trading in the U.S., is up 14.60% this year, indicating British stocks are pricing in a Brexit outcome that is favorable. The $2.33 billion EWU devotes over 20% of its weight to financial services stocks, a meaningful sector allocation because European banks have been front-and-center in the Brexit debate. While this Europe ETF has performed admirably this year, there is some risk that a hard Brexit could sting U.K. banks. British banks, including some residing in EWU, are already taking steps to deal with a post-Brexit world. “Nearly 300 financial firms in London have shifted about a trillion pounds in assets to new hubs in the EU to mitigate the uncertainty and avoid disruption to customer ties,” according to Reuters. EWU yields 4.44% on a trailing 12-month basis and its financial services exposure is offset by a more than 34% weight to the energy and consumer staples sectors. Predictably, Brexit is affecting the pound, but the Invesco CurrencyShares British Pound Sterling Trust (NYSEARCA:FXB) is up almost 2.70% this year. That Europe ETF measures sterling’s performance against the dollar. Should Brexit talks lead to material depreciation by the pound, which would benefit U.K. exporters, the Xtrackers MSCI United Kingdom Hedged Equity ETF (NYSEARCA:DBUK) is a Europe ETF that would benefit. Although DBUK is designed to deliver upside when the pound weakens against the U.S. dollar, the Europe ETF is up 12% this year even with the British currency trading higher. DBUK’s underlying index features a currency hedge, but the index is similar to the one tracked by the aforementioned EWU, so DBUK’s sector weights are also similar to those found in its unhedged rival. “Nigel Green, CEO at the deVere Group, said the pound could benefit in the short-term from added time for Brexit negotiations and Britain not leaving without a deal this Friday,” reports The Express. Dividend strategies can provide investors with buffers against macro volatility, some of which could still be looming for Europe ETFs thanks to Brexit. That could heighten the utility of the ProShares MSCI Europe Dividend Growers ETF (CBOE:EUDV), a Europe ETF that requires member firms to have dividend increase streaks of at least a decade. Unlike the other Europe ETFs highlighted above, EUDV is not a dedicated U.K. fund, but British equities do command 39.63% of the fund’s weight, which is by far EUDV’s largest geographic exposure. France and Switzerland, two other dependable European dividend growth markets, combine for almost 23% of EUDV’s weight. Even against the backdrop of Brexit, U.K.-based companies are expected to post modest dividend growth this year while EUDV’s other geographic exposures could deliver higher percentages of payout growth. Most Europe ETFs and U.K. funds are cap-weighted products, but the First Trust United Kingdom AlphaDEX Fund (NASDAQ:FKU) presents investors with a smart beta avenue to U.K. equities. FKU’s underlying index, the NASDAQ AlphaDEX United Kingdom Index, identifies securities by “ranking the eligible stocks from the NASDAQ United Kingdom Index on growth factors including 3-, 6- and 12- month price appreciation, sales to price and one year sales growth, and separately on value factors including book value to price, cash flow to price and return on assets,” according to First Trust. Home to 75 stocks, this Europe ETF is a different beast than rival U.K. funds. The median market value of FKU’s holdings is $8.35 billion, putting the fund in mid-cap territory. Additionally, FKU is a play on how the British consumer will react to Brexit as the fund carries an 18.59% weight to consumer discretionary stocks … its largest sector allocation. Overall, this Europe ETF is not as a defensive as traditional U.K. funds, which could be a good thing or a bad thing depending on how Brexit ultimately shakes out. Some market observers have been discussing Brexit-related opportunities with small U.K. stocks. A diversified Europe ETF for playing that theme is the iShares MSCI Europe Small-Cap ETF (NASDAQ:IEUS). Home to nearly $283 million in assets under management, this Europe ETF tracks the MSCI Europe Small Cap Index and holds just over 1,000 stocks. 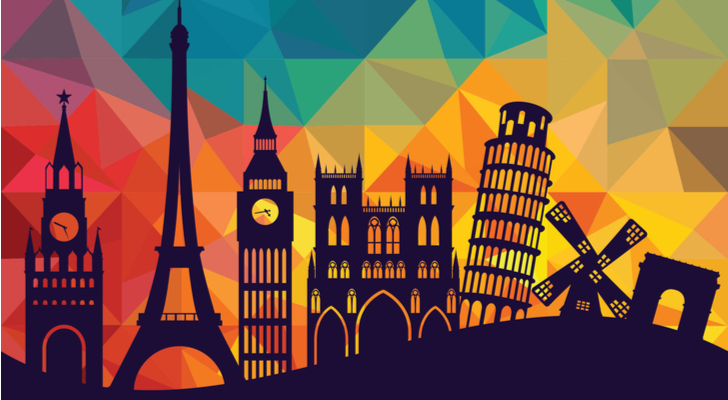 While there are many small-cap opportunities in Europe, Europe ETFs dedicated to smaller companies usually feature significant weights to the U.K. With a U.K. weight of 33.78%, IEUS is not an exception to that rule. Overall, roughly 15 countries are represented in this Europe ETF. IEUS is a heavily cyclical fund with almost 34% of its combined weight allocated to industrial and consumer discretionary names. With a standard deviation of 14.43%, IEUS is actually less volatile than the U.S.-focused Russell 2000 Index, but volatility could rise for the Europe ETF if a hard Brexit comes to pass. Article printed from InvestorPlace Media, https://investorplace.com/2019/04/5-europe-etfs-to-consider-brexit-talks-continue/.